How does Final Fantasy X/X-2 hold up almost two decades later? Amazingly well, to be honest! The Final Fantasy franchise from Square Enix is one of the most recognizable JRPGs ever made, and usually with at least one title setting the bar for each console generation of its time. While many recognize Final Fantasy VII (we reviewed the Nintendo Switch port a few weeks ago) as the defining game for the original PlayStation, the same can be said about Final Fantasy X for the PlayStation 2 back in 2001. And then two years later, X-2 picks up right where X left off. Both of these games are classic PlayStation 2 titles that raised the bar in terms of JRPGs on the console, and set forth standards for future generations. Final Fantasy X/X-2 HD Remaster is not new, since it's been released for the PlayStation 3 and PlayStation Vita in 2014, then the PlayStation 4 in 2015, and Windows in 2016. However, it's now also available on the Nintendo Switch, bringing yet another Final Fantasy title to the hybrid handheld console. So how do these definitive PlayStation 2 titles hold up almost 20 years later? Bottom line: Final Fantasy X/X-2 HD Remaster is a compilation of FFX and FFX-2, including story content from the International version that was previously not released in North America. The original PS2 graphics from these games have both been smoothed out and polished, the cutscenes look even more stunning, and the improved sound quality is quite noticeable. This Nintendo Switch version of the HD Remaster for X and X-2 make it even more accessible to an entirely new generation, and veteran fans can enjoy it once again on-the-go. Final Fantasy X was a must if you had a PlayStation 2 console. I had a copy for my PS2 Slim, but again, while I dipped my toes into it for a bit, I never beat it because of the lack of time and a PS2 isn't exactly a portable. Now that it's out on the Nintendo Switch, I can give it another go, and I'm definitely loving it. The story and plot for FFX and FFX-2 are definitely one of their strongest points. In FFX, you'll follow along in the journey of a teenager named Tidus, who is an all-star Blitzball player who ends up getting transported to Spira after his homeworld of Zanarkand is attacked by Sin. He then meets Yuna, an apprentice summoner who sets out on a pilgrimage to collect all of the Aeons and defeat Sin. Tidus eventually becomes one of her many guardians after discovering that Sin has a connection to his father, as well as Yuna's. In FFX-2, the story takes place two years after the ending of FFX, and Yuna is a treasure hunter in search of spheres that may eventually lead her back to Tidus. Regardless, the story for both games can get quite emotional, and there are plenty of cutscenes to watch as the story unfolds. The quality of these cutscenes is definitely high definition, so even if you've played the games before, it's worth another play-through to enjoy these scenes in glorious HD. When you get a non-cinematic scene, the character models do show the age a bit, but the graphics are smoothed out and noticeably better compared to the original. The voice acting and soundtrack are also better, and you even have the option of going with original or improved soundtrack with FFX. Though I did notice some oddities when it came to character models and their facial expressions and mouth movements when speaking, such as not syncing up perfectly with the dialogue. Despite being a game from the early 2000s, the gameplay elements in both titles still hold up very well today. With FFX, you get the Conditional Turn-Based battle system, which allows you to switch out party members in the middle of battle. You eventually have eight characters to manage, and since it's turn-based, you can take your time thinking about the best character to handle certain situations. FFX-2 harkens back to the traditional Job system of earlier Final Fantasy games through the use of Dresspheres and the Garment Grid, which lets you change jobs in battle since you only have three playable characters the entire game. FFX-2 also utilizes an Active Time Battle system, so while enemies can perform actions while you pick your moves, there's also the opportunity to interrupt them and also chain up combos. FFX also doesn't have the classic leveling up system that you're used to. Instead, as each character gains experience points, they earn a Sphere Grid level. This lets you move around on the Sphere Grid for each character, unlocking skills or improving attributes by using different types of spheres. The Sphere Grid system lets players customize each character to best suit their intended roles. The HD Remaster also includes the Expert version of the Sphere Grid (originally in the International version), which has each character start in the middle of the grid and can follow whatever path the player wants. The trade-off is that there are fewer nodes this way, so there are fewer upgrades. In FFX-2, players obtain different jobs through dresspheres. Each character can have one dressphere at a time, which grants them access to different abilities and functions in battle. Battles net you Ability Points (AP), which go towards each job ability until it's learned by the character. Each team member can access up to six dresspheres at a time, so you can customize someone as you see fit. On top of it all, FFX-2 retains the traditional leveling up system, so your characters get stronger by earning experience and AP in battle to gain levels and learn skills. Since this is the HD Remaster of FFX and FFX-2, you'll also be getting content that was previously exclusive to the International version. This includes the Expert Sphere Grid I mentioned for FFX, along with several optional bosses. With FFX-2, there are extra dresspheres and new mini-games. And both have bonus cinematics to watch and enjoy once you beat the game. As someone who has been wanting to play these classic Final Fantasy titles in true HD glory, I'm glad that Final Fantasy X/X-2 is now available on my favorite console, the Switch. Even though these games are originally from the early 2000s, the HD Remaster looks downright fantastic on the Switch. Most of the jagged edges from the original release are gone, environments are lush and full of incredible little details, though you can still tell that some textures are from the PS2 era. And the cutscenes are just amazing, beautiful, and definitely worth watching, even if you already know the story. And if you've never played FFX or FFX-2 before, then you're in for a treat with these cinematics. I've spent more time in FFX than FFX-2 this weekend due to a time crunch, but so far I prefer the battle and leveling system in FFX more than X-2. I feel less stress with the turn-based combat, and being able to easily swap out characters as I see fit makes battles feel more controllable. However, I appreciate that X-2 has a different battle system that's a throwback to the classic job system because it would have been boring if it was the same system for both games. And from what I've heard, the dressphere job system is much more fun and manageable later on in the game, so I'm looking forward to diving into it even further after I beat FFX. Though I feel like FFX/X-2 HD Remaster can definitely pass as a modern game, there are times when it's very obvious that they're games from an older time. I'm talking about those jarring camera angles when you explore tight spaces in dungeons and towns, where the camera just changes angles without any warning to you. It's different from modern games with seamless camera angles as you explore, and there are plenty of times when I wish I could rotate the camera for a better view of my surroundings. Another thing I noticed is that you don't have the liberty of skipping any cutscenes in FFX, though you can skip them in FFX-2. This may not be an issue for someone who is enjoying the game for the very first time, but I can see it being a bit of an annoyance for those who have played the game before. It's a bit odd that X-2 has the ability to skip, but not X.
I was also hoping that there would be some kind of fun gameplay modifier in this remaster, similar to FFVII and the no-encounters, 3x speed, and always over-limit godlike modifiers, but there's nothing like that in this port. You'll just have to play and experience the game as it was originally meant to be played. Finally, it's a bit annoying that Final Fantasy X/X-2 HD Remaster is $50 on the Nintendo Switch, even though the game is as cheap as $20 for other consoles like PlayStation 4. But considering that the Switch is a home console and a handheld system, and you're getting two games in one, it's not so bad, especially if you've never played either game before. Final Fantasy X is hailed by many as one of the greatest Final Fantasy games of all time, up there with FFVII, and it has rightfully earned that title. Final Fantasy X-2 is a fun sequel with an interesting twist on traditional gameplay mechanics, so getting both of these games on your Nintendo Switch is a no-brainer. And since it comes with the International version content that wasn't released before the HD Remasters, it's a good reason for even veterans to play through the game again. And if you've never played FFX or FFX-2 before, then this is the perfect opportunity to do so. 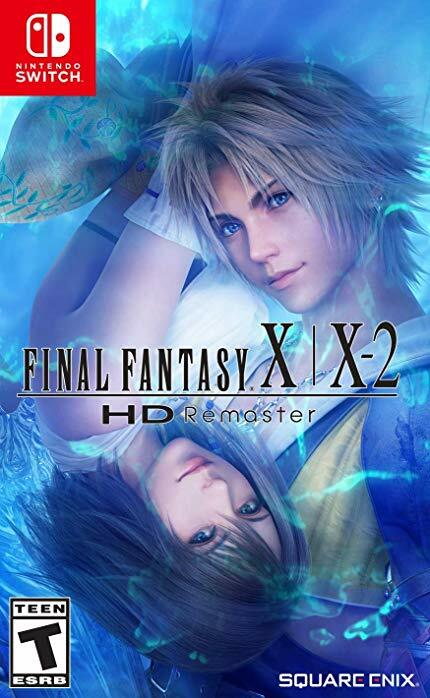 Final Fantasy X/X-2 HD Remaster on Nintendo Switch includes two amazing Final Fantasy games that defined the PS2 era. Help Tidus and Yuna save Spira from the evil Sin, and then guide Yuna on a treasure hunt for spheres and reunite her with Tidus along the way. The HD Remaster includes bonus content for both games that was previously only available in the International version.